Electrical conductivity is the measure of how well a substance conducts electricity. It is expressed as 1/(Ohms-centimeters) or mhos/cm. Mho is the name that was chosen for the inverse of Ohms. Copper is a soft and malleable metal with a bright gold to a dull brown color. Aluminum is a silver-colored metal that is lighter and stronger than copper. The two metals are close on the scale of conductivity, with copper having the more desirable characteristic. The conductivity of copper is about 0.6 megamho/cm while that of aluminum is about 0.4 megamho/cm. A one-meter long wire with a cross section of one square millimeter has a resistance of 1.7 milliohms (.0017 Ohm) if it is made of copper, and 2.5 milliohms if it is aluminum. 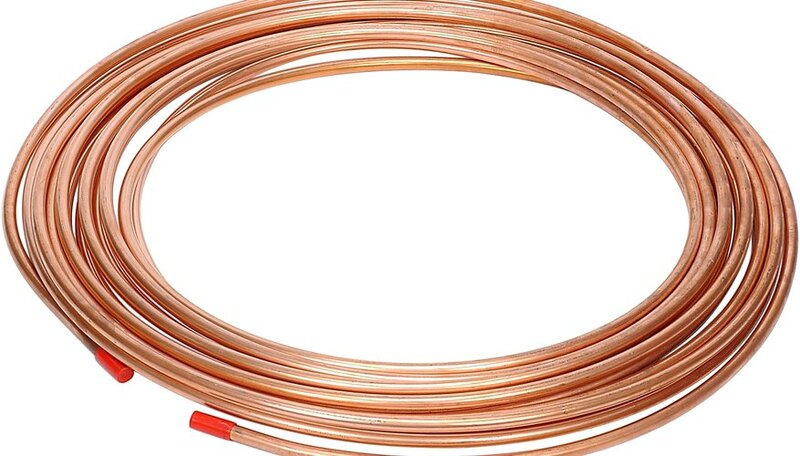 Due to its excellent electrical properties, copper is used extensively for electrical wiring. In power distribution, aluminum is sometimes used instead of copper. Aluminum costs and weighs only about one third as much as copper. Aluminum was once used in home wiring but it corrodes easily, which can lead to high resistance and heat buildup at connection points. The residential use of aluminum wire was discontinued in the 1970's due to this hazard. Patton, Don. "Aluminum Vs. Copper Conductivity." Sciencing, https://sciencing.com/aluminum-vs-copper-conductivity-5829267.html. 24 April 2017.